A few weeks ago, I saw a sweet potato and black bean burrito recipe. Being a sweet potato lover, the recipe interested me. I added the idea to the bottom of my mental “recipes to try” list. Also on my long list of recipes to try, was mole sauce. Mole sauce has always intrigued me. Mole sauce is a brown/red sauce that originated in Mexico. There are many legends about how the sauce was first created. Mole sauce has just about everything you can imagine in it. There are many versions of mole sauce but most popular is Mole poblano. I have always thought the spicy tomato sauce with cocoa sounds a little gross, but then again, I have never met anything with chocolate that I didn’t adore! When I saw this recipe for yam and black bean enchiladas with mole sauce at The Keen Kitchen, it went right to the top of my to try list. I couldn’t wait to try mole sauce and the sweet potatoes and black bean combo! I gotta be honest. I didn’t think my family would like it. I like to be adventurous in the kitchen, but my kids are not always up for the ride. I planned to make the enchiladas on a night when we had plenty of leftovers in the fridge to fall back on if the kids rejected my new recipe. Once I actually prepared the dish, I knew my kids wouldn’t like it. It’s not an attractive dish. I was sure the brown mole sauce would bring up some potty talk, if you know what I mean. I sampled the enchiladas before calling the family to the table. I took the first bite of the enchiladas without the sauce. Mmm. My sweet tooth was very happy. I can imagine making sweet potato and black bean burritos for many meals to come. On the second bite I included some mole sauce. Wowza! It was spicy. It was salty. It was sweet. It was like a little party in my mouth. I called the family to the table and offered plenty of sour cream to cool the kick. To my surprise, 3 out of 4 kids loved them! The only kid who didn’t like the enchiladas couldn’t have sour cream. We usually use ketchup to cool Bella’s Mexican food, but ketchup didn’t work well with this dish. The second time I made the dish, I served cilantro guacamole as a dairy-free alternative to sour cream. I thought it was fantastic, but Bella wasn’t interested in trying it. Even though my kids were great, next time I will fix this meal as burritos with the sauce on the side. The mole sauce is very bold, and I think they will enjoy it much more if they can control their portion. 1. Bake the sweet potatoes. 2. Prepare the Mole Sauce. A. While the potatoes are cooking, prepare the mole sauce. Heat oil in a medium saucepan. Add garlic, onion and bell pepper and cook until onions are translucent. B. Add remaining mole ingredients and combine well. Simmer, stirring often, 5-10 minutes or until desired thickness is achieved. C. Transfer sauce to a blender or blend with an immersion blender until sauce is smooth. Set aside. 3. Prepare the Sweet Potatoes. In a small bowl, mash the sweet potatoes and add garlic powder and salt and pepper to taste. Set aside. 4. Prepare the Black Beans. Drain and rinse black beans. Set aside. A. Preheat the oven to 350 degrees. B. Spoon some sauce into an 8 X 8 pan and spread to coat the bottom of the pan. C. If necessary, heat the tortillas in the microwave to make them more pliable. D. Fill tortillas with a scoop of sweet potato, a scoop of beans and a little mole sauce. Roll them up and place in the pan. E. Pour remaining mole sauce over the enchiladas. Cover and bake for 30 minutes. 6. Garnish with your favorite toppings and enjoy! 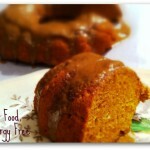 You may also enjoy How to Freeze Sweet Potatoes, Chicken Fajitas and 2 Ingredient Pumpkin Cake. This looks great, Nancy! I’ve never even considered sweet potatoes with something like this. I like the combination. Katie, Have you made mole before? Do you think this recipe sounds authentic? I’m curious what you think since I’ve never had it before. Thanks for the invite Denise. I did! Looks good! I tried sweet potato and black bean enchiladas (from the Moosewood Cookbook) once and it was great, but never thought to put *mole* sauce on top!! Sounds delicious. I can’t wait to try it – – my hubby would love it. Thanks Carla! You know, I have a Moosewood book but I haven’t cooked anything from it. I need to get that thing out! thank you for sharing another amazing recipe with us on “Made it on Monday”! Wow, that sounds super delicious and unique! I have always wanted to try mole sauce but haven’t as of yet! I know a restaurant that has yamchilada’s and they are so good. Can’t wait to try this! Thanks for sharing. Yamchiladas! I love it. I think I’m going to update my title. Thanks Sarah! That looks amazing. I make black bean and sweet potato burritos all the time, but I never thought to top them with a mole sauce. Thanks for sharing! These sound and look sensational! Cannot WAIT to try them out! I’ve been looking for a mole sauce recipe. 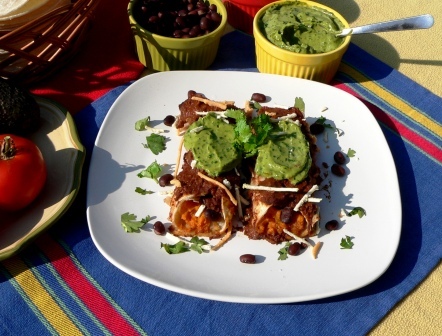 ZTejas has amazing mushroom enchiladas with mole sauce… will definitely try yours! Thanks for sharing. I also wanted to mention, and it may just be my browser, but the FB, Twitter & SU box blocks your content, making it very difficult to read your blog. For me it was about 1.5 from the bottom and about 1 inch in from the left of the page. Again, may just be my browser (Mozilla) but I thought you would want to know. THANK YOU! I’ll have my tech guy (DH) look into that. I really appreciate you letting me know. THANK YOU JUNE! I’ll have my tech guy (DH) look into that. I really appreciate you letting me know. I have never been adventurous enough to give mole a try. My tastes are changing though. We had black bean enchiladas with pumpkin sauce last winter and that was a far cry from our norm. We loved them. Your enchiladas look and sound fantastic. You’ve made me want to give mole a try! Thank you! Oooh. I’d love to try the pumpkin and black bean enchiladas. Do you have a link to it? The original recipe came from Shannon at Tri to Cook. 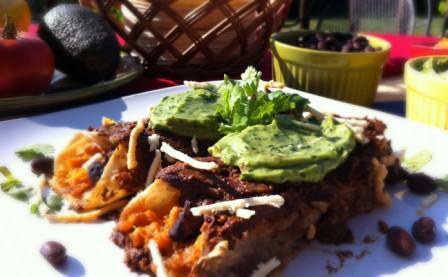 Her link is at http://tri2cook.blogspot.com/2011/01/pumkin-black-bean-enchiladas.html. She has a lot of great recipes and is very sweet. You should definitely hop over to see her. 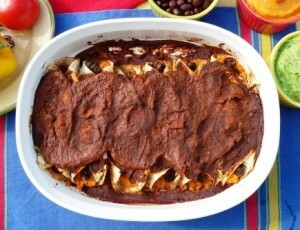 If you want to see my post about them, you can find that at http://discoveringcandace.blogspot.com/2011/01/pumpkin-black-bean-enchiladas.html. Hope you are having a great weekend! Thank you so much Candace! I can’t wait to try them. 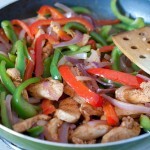 This is a great mexican food recipe. We just love the sweet potato and black bean combination and the mole really makes this one a winner. We will be trying this very soon. Hope you have a great week end and thanks for sharing with Full Plate Thursday! I am so happy you and your family enjoyed this recipe, Nancy! And you definitely succeeded in making the enchiladas attractive in your photos… I certainly struggled with mine! I did the best I could. That sauce is not visually appealing! Thanks again for the recipe! This looks absolutely gorgeous and delicious. What a comforting and satisfying dish to make…..gosh, you’re making me hungry and craving for one now. Thanks Amy! Congrats on your blogiversary! Great post! I have to confess I’m not a huge fan of mole, but your dish looks delicious, and I love the burritos! Thank you for sharing an excellent post with Let’s Do Brunch! What a great looking dish. I cannot wait to try it out. Mole is to die for. Come over and visit us. We have a terrific tomato pie this week. 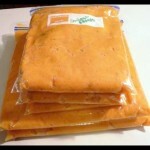 I am not the biggest fan of Enchiladas unlike the rest of my entire family, but I would love these with sweet potatoes. Thank you for sharing this at Foodie Wednesday. Hope to see you there today with another recipe. Yum! I’m always up for a new enchilada recipe! Thanks for sharing it at Cast Party Wednesday. I hope you join me next week for another great party filled with amazing recipes! These sound so delicious and healthy. Must try it. Wow! SO brave to try a recipe so elaborated like Mole. I like the idea for enmoladas with Sweet potato. If you ever want to try the recipe for Mole from Puebla you could find it in my blog. Thanks for sharing at Miz Helen’s Full Plate Thursday. I am a new subscriber now to your blog. Welcome Mely! Yes, I was so proud of my kids. I LOVE your blog. We love Mexican food. Just a note to let you know I shared your awesome dinner/main dish inspired recipe on my monthly recipe round-up. If you get a chance, come on over and check out the other dinner ideas ranging from meat-based to vegan.